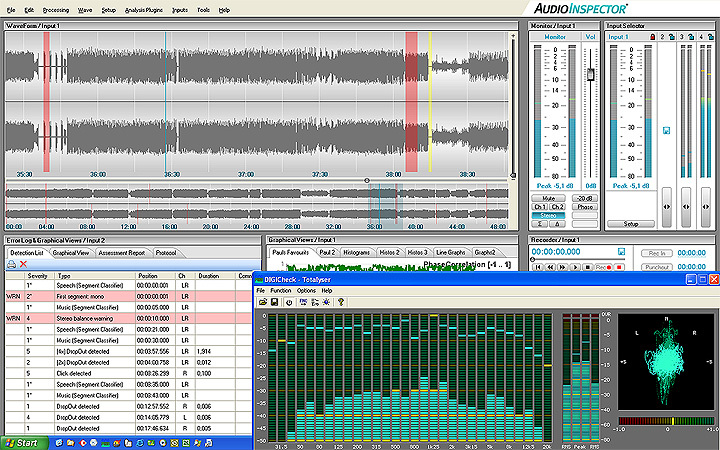 AudioInspector allows ingestion from up to four machines in parallel on a single PC. The input channels can be individually configured to record with different recording and detection parameters. Feature availability only depends on the hardware/software configuration selected and on the playback devices. Simultaneously, you can verify and assess the detected artefacts and the overall recording. You can predefine as many machines and settings as you like (software input channel assignments, interface input channels, EQ settings, remote control settings) for easy selection later on. If possible, the machines can be handled via a remote control interface. When available for the respective machine, we focus on the integration of parallel remote interfaces rather than serial interfaces. Most of the time, the required serial interface cards for analogue machines have not been purchased during their usage and are usually not available any more for most historic machines. If you do not find the machines you wish to use for playback listed (see Accessories) please send us your requirements. We are more than happy to integrate additional interfaces on demand. Ingesting is possible in the same, half, double or even 4x the speed of the original recording. Half speed recording can be useful for digitization of analogue records, double speed digitization for some recordings on analogue tape. AudioInspector corrects the selected EQ curves according to the selected speed settings in order to reconstruct the original sound as accurately as possible. When playing back with optical pick-ups there may be no need for corrections of the transfer EQ - even when the transfer is done at other speeds than 1:1. AudioInspector therefore also offers to deselect EQ corrections that allow easy implementation of optical pick-ups for analogue records or analogue tapes. AudioInspector allows to store files in the most common standards for preservation projects. Currently, the following formats are available: BWF and RF64. Please inform us in case you require a different format. We will be happy to support new formats on demand. On some tape formats audio is recorded in the opposite direction, e.g. Magnetophon tapes. 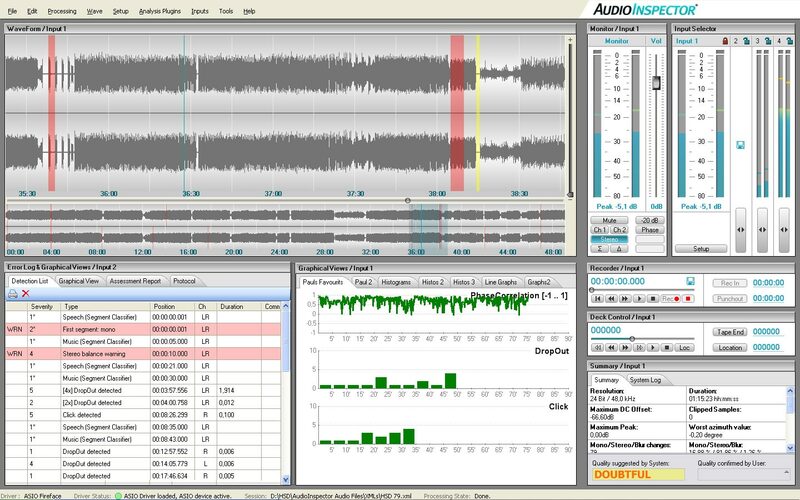 AudioInspector is designed to allow the ingestion of audio tracks recorded in opposite direction in just one single step. There is no need for flipping the tape for recording in the other direction. The content can be captured right away. AudioInspector distinguishes between artefacts that are critical because they could be caused by the ingestion process itself (warnings are emitted) and artefacts that are recorded on the source tape. Detections of the same type are locally clustered to reduce the amount of detections displayed. Manual comments can be added to the automatic detections. Manually entered "detections" can be created at any time. The detections can be monitored and assessed while recording in the current input channel and also when recording in other input channels in the background. Detections can even be deleted from the list but can be recalled at any later stage. All events and technical parameters detected - or manually added - are stored in an XML metadata file for an easy import into existing database systems. Users who have deleted detections in the detection log or have changed the Overall Quality Assessment are logged into the metadata. After the automated artefact detection and analysis of technical parameters have been completed, the system evaluates the overall quality of the recording and indicates either OK or Not Good. Users with respective rights can change these indications. The confirmed or changed overall assessment data is stored together with the metadata in an XML file. The user who has made the assessment is logged into the metadata. As an optional service, we offer you to send us an entire series of such XML files for customization of the rule-based expert system according to your quality standards. These files are used to run them through machine leaning algorithms that will adopt the decision rules for the expert system. The new decision rules are available in your AudioInspector systems after a software update. 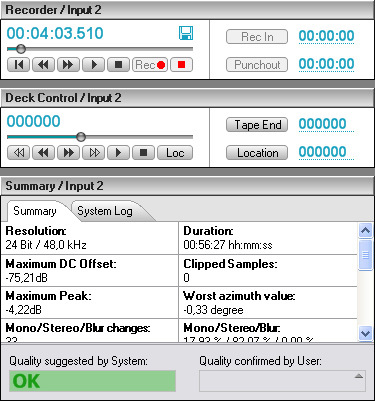 Audio Inspector is delivered with a full set of software based EQ filters for tapes and records. They cover most existing EQ standards in recording media. If you do not find the filters you wish to use for playback listed in the table below please send us your requirements. We are more than happy to integrate additional filters on demand. Most facilities do not have calibration tapes available for all the EQ standards ever used in recording media. As a matter of fact, such tapes are not even made any more for most standards. 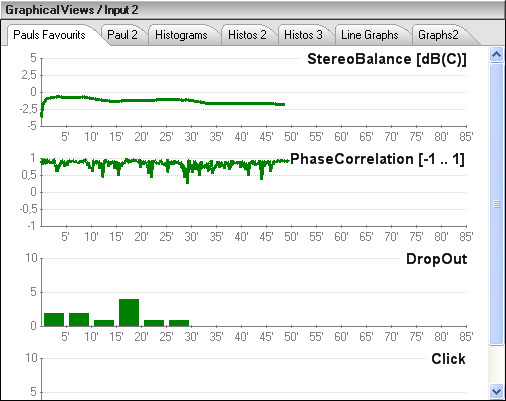 For convenience purpose, your playback machine is set to current EQ standards. AudioInspector allows you to select the Recorded Replay EQ. Having this information and combining it with the data on the current EQ setting of you playback machine, AudioInspector calculates the necessary difference between these curves and applies them to reconstruct the original sound of the audio material in the best possible way. When analysing different formats or series of sources it can be advantageous to store parameter sets with configurations that you have found to deliver good results for you. E.g. you might wish to turn off ‘click detection’ during a record analysis when you are aware that the series is full analogue clicks. Or you might decide that you only wish to be notified if clicks are serious, meaning they are beyond an intensity of 5. 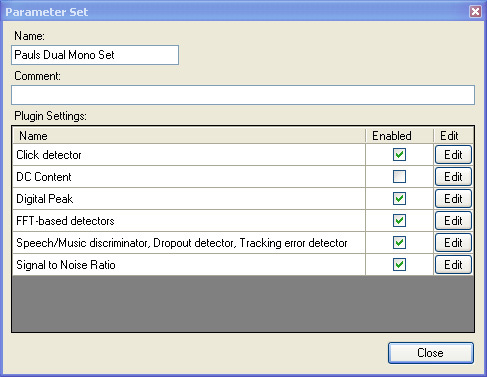 AudioInspector even allows you to modify parameters that are changing the behaviour of the detection system to various degrees. 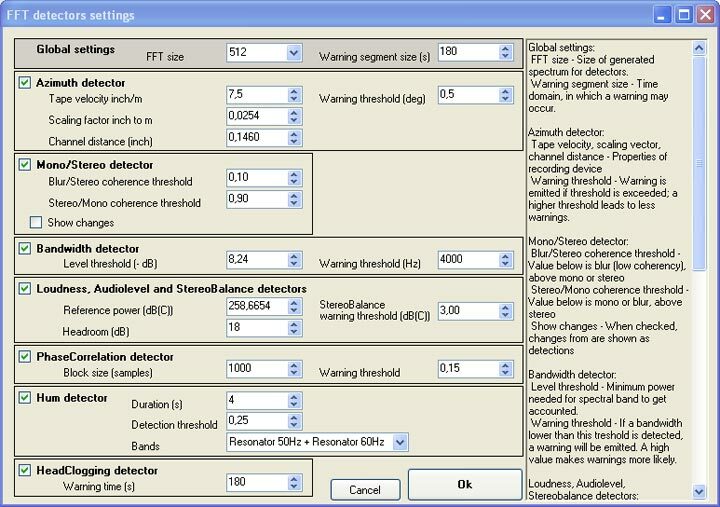 The possibilities range from switching single detectors to ON or OFF, modifying thresholds for warnings or changing single algorithm parameters. All changes can be made for the current project only, single parameter sets or in general. CAUTION: Changing the algorithm parameters in general might cause very varying results depending on the variety of recordings. We therefore recommend this feature to only be used by very experienced users. You can create comments along with any manual detection by double-clicking its comment blank or pressing "Ctrl-C". You may also manually create entire detections whenever you wish by pressing "Ctrl-Space" during recording. You may also erase detections from the detection log. However, deleted detections will only become invisible in the detection log and the respective charts. The detection will not be fully erased can be undone at a later point. When you use trimming or normalize on a file you have created, a new file will be generated with the editing applied as set. However, AudioInspector will never overwrite originally created recordings. You will always be able to switch back to the original recording when storing these files. This procedure ensures also that you do not depend on any vendor proprietary file formats. When applying a trim to one of your files the detections within the area that has been cut off will also be deleted from the detection log. 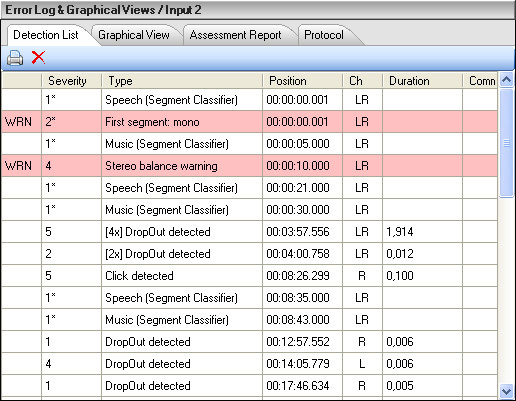 Therefore, detections shown in the log of the trimmed file will be in-sync with the audio again. AudioInspector allows you to define an "unlimited" number of users who are legitimized to work with the system in the back office of your customer account. Users are required to login before starting to work with AudioInspector. Users who have deleted detections in the detection log or have changed the Overall Quality Assessment are registered in the metadata. 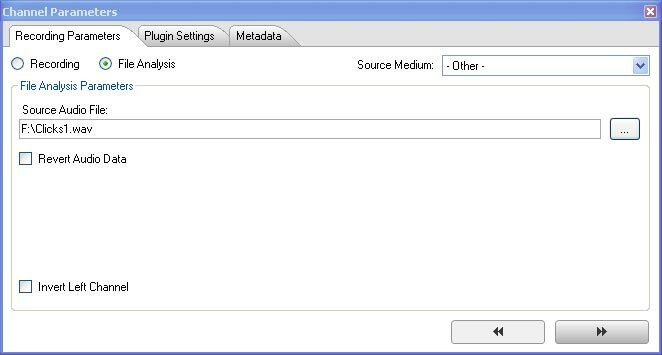 AudioInspector also logs other status information created during the analysis, besides the user data. The system log information can be found in the summary display field. To identify made recordings users may fill in various metadata fields. The ID metadata will be saved in XML files, as well as in the header of the audio files - if the audio file format permits. The entire metadata created by the system is stored in an XML metadata file. It can be imported in any existing database system and can also be read by dedicated viewer software for distributed verification and quality assessment within your network. The general metadata fields are compatible to the EBU Core Metadata set. The A/D converter we recommend to use with AudioInspector is Fireface™ from RME. Fireface 400™ delivers 8 analogue audio channels with a resolution of 24bit / 192 kHz (the current maximum for audio A/D converters) plus 10 digital input channels at a price of around € 880 (status 08/2007). Together with Fireface™ you will also receive a software called DIGICheck - Totalyser™. This software delivers a hardware supported phase monitor, correlation meter, peak meters and a spectrum analyzer which can be used for set-up and actual recordings with AudioInspector. 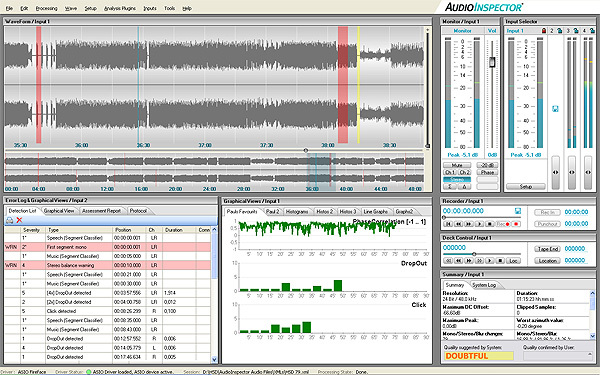 AudioInspector allows analysis of files that were created with other audio recording tools. The only requirement is that the files have been stored in a supported audio file format. Moreover, the patch inspector enables an automated file-based analysis via drop folder automation or Webservices / SOAP support. If you want to integrate AudioInspector into your Content Management and/or Workflow System, this can easily be done via Batch Inspectors Workflow module. This interface allows simple data exchange with your CMS and can also be adapted to your requirements by your own IT department. If you have any special requirements for integration of AudioInspector (Batch Inspector) into a CMS, please let us know. We will be happy to integrate them for you. When creating high-resolution archive files, it sometimes makes sense to create low resolution browsing files at the same time. If you select the creation of MP3 browsing files as a prerequisite, AudioInspector will create these for you by accessing external MP3 converters that support command line operation (e.g. "Lame" a free converter that can be downloaded at http://lame.sourceforge.net).